The following group types are not accepted by this hostel: Junior / Primary School, College / University, Stag/Hen/Bachelor Party If you have misrepresented the type of group you are booking for, your booking may be cancelled by the hostel." 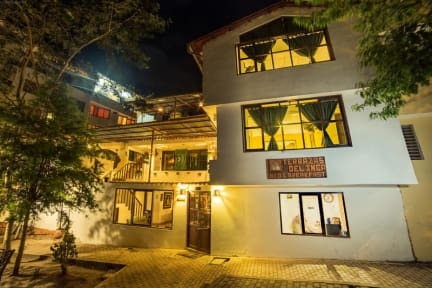 Our Terrazas Del Inca B&B was constructed over the last 2 years, with an eye toward adding every special touch to keep our guests comfortable and happy. The views from our terraces are fantastic and from the rooms you can look over and appreciate all the natural beauty of the town of Machupicchu. We are only 3 blocks from the train station where you will arrive . From our to the hot springs is just a 5 minute walk. And we are only 2 blocks from where you will catch the bus that will take you up the zig- zag trail to the famous Ruins of Machupicchu on top of Machupicchu mountain. It is a 15 minute ride to the top. Terrazas del Inca B&B, . Address : Wiracocha street. 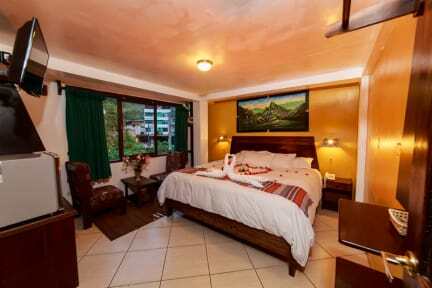 Bed and breakfast in the village of Machupicchu which is also called Aguas Calientes. It is in a excellent location.